The original version first appeared on June 20th at TheAsiaParent. This is a reprint with edits. Are you planning to get a new printer? With so many brands in the market , you would probably be spoilt for choice. In the past the problem with choosing a printer were what functions and quality of the print they can provide. Today as technology advances, printers have evolved to a stage where it is difficult to distinguish between the brands. Function wise, it would be easy to find multifunction printers that has print, scan and copy features build into an affordable machine. Furthermore, most new printers includes wifi capabilities that can link up to the home network for ease of printing. With an even playing field , how do you choose a printer for your own To differentiate from the rest, HP introduced HP Print apps for Work, Education and Play. The HP Print apps are available exclusively to HP range of web- connected printers. For our case, the apps are found on the control panel of the HP Photosmart 5520, a web-connected printer, that was provided for this review. This is what I call Bao-Ka-Liao. You would probably think I had gone bonkers with this notion. On the contrary, HP had team up with SAP education to provide enriching worksheets base on the latest curriculum from SAP's bestsellers for your child's personal use. After a quick search, I had managed to find Mid-year assessment set for English and Mathematics. This would be perfect for my Primary school by to attempt during this school holidays. With this complimentary service, you can now save money and time sourcing for assessment books. Other educational apps worth exploring include onSponge and The World of Wonder. For the younger ones, Crayola and Leap frog apps are great for activities base prints such as colouring. They say all work and no play would make Jack a dull boy. So it is a blessing that HP apps do provide entertainment for the children. There are HP Printables from trusted brands such as Disney , Angry Birds, Garfield and more. HP even partners with Dreamworks to feature printables from their animated movies. The latest avaliable for download features printables from the movie How to Train your Dragon 2. With their interest piqued , the boys wasted no time in making their own masks with the HP Printables. Having a printer that provides entertainment to the children would be great for impromptu fun. You simply print all the fun stuff from the comforts of your home. That would mean fun on demand at any time of the day! It also means saving money and that is a huge bonus for most parents. Have fun with HP apps ! Since this is a family friendly printer, adults are not left out. HP apps have something in store for you. For the culinary experts, there are recipes for you to explore. For those who want to keep updated, Forbes Daily, NBC News and Bloomberg apps are available for print. HP apps are certainly fun for the family. With family friendly activities at the touch of your fingertips, HP might just get your family hook on printing! 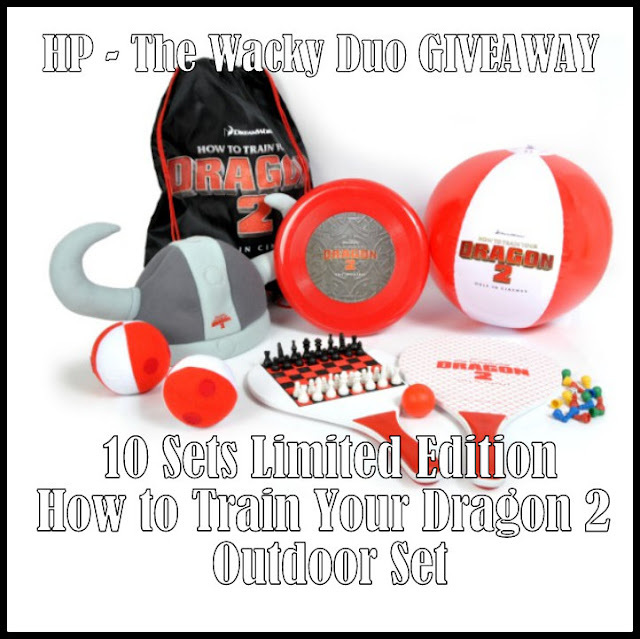 For our readers, we have a special giveaway courtesy of HP.We are giving away a limited edition How to Train Your Dragon 2 outdoor set for 10 readers. HP Photosmart 5520 was provided for this review. All opinions are our own.